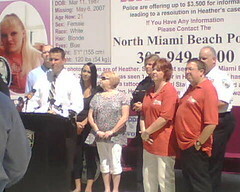 This morning I attended a Press Conference held by the North Miami Beach Police and Kid Finders Network for missing person, Heather “Kitty” Riggio. I was invited by Sherri Milstead, the Executive Director of Kid Finders Network. She learned about Lilly’s case and contacted me earlier in the week. Kid Finders Network is a nonprofit organization which provides mobile billboards to families, organizations and Law Agencies in search of Missing Children and Missing Persons. They provide digital fingerprinting at public events and private sessions where there is 10 or more children. They offer custom websites, assist in searches, door to door flyers and from what I’ve seen, it seems they would do almost anything to help find a missing human being. They have a mobile billboard (pictured above) with Heather’s information and picture on it. It will stay at the police station in North Miami Beach until Monday. After that it will go to the area where Heather was last seen at in Homestead. It will cruise the area, increasing the odds of someone calling with an important tip. The drivers are trained in taking tips, too. You can see my entire set of pictures of the press conference and the mobile billboard by clicking the link under the picture. Lilly’s mom and I could not contain our tears as we watched the press conference taking place. It’s interesting because we’re not emotional people. But this is an open wound for us. You can’t help but feel overwhelmed with compassion for families experiencing the same suffering. It was heartbreaking. But at the same time, I saw the dedication and all the effort put forth by the detectives from North Miami Beach Police Department. What a blessing for Heather’s family. I’ve been following her case and from the start, these detectives have done such a great job. I admire and commend them for their commitment and efforts to find Heather. They were able to get her story featured on America’s Most Wanted. Narrative: Kid Finders Network will be assisting us with a missing person case where a young female, Heather Riggio, went missing on May 6, 2007 and the public’s help is paramount to helping us find her or find out what happened to her as foul play may be involved. Kid Finders Network is providing an innovative way to assist law enforcement with the recovery of missing persons by providing a mobile billboard that will feature vital information such as photographs of the victim, the areas she frequented, etc. which will be deployed in the area Heather was last seen. Kid Finders will be at the North Miami Beach Police Department on Friday, July 11th at 11:00 AM with the billboard provided for this case. Representatives from Kid Finders Network as well as NMB Chief Rafael P. Hernandez, Jr. and Lead Case Detective Rich Rand will be present to speak about the case and unveil the highly effective and innovative billboard that will profile this case. The original missing person flyer that features pictures of Heather Riggio will follow this press release and for information regarding Kid Finders Network you can visit their website at www.kidfindersnetwork.com. For more information regarding this press release please call Detective Rich Rand at 305-218-1234 or Sergeant Warren Hardison.